Why Don't More People Investing In Property? Why Don't More People Investing In Property? If property is such a great way to make money and achieve financial freedom then why don’t more people invest in property? There are many reasons. If investing in property is such a great way to make money and achieve financial freedom then why are more people not investing in property? Hi, I am Ryan from OnProperty.com.au helping you find positive cash flow property. There are a lot of people out there – a lot of people who listen to my podcast, watch my videos or read my blog, who want to invest in property but have not yet took the leap in order to invest in property. I also get a lot of customers who join On Property listings who have the intentions to purchase property but never actually go ahead and do it. Property is so popular. Property is such a great way to make money. 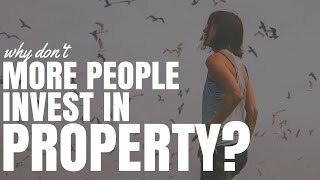 Why do more people not invest in property? Well, there are a lot of reasons – and everybody is different so everybody has a different reason, but I want to give some of the reasons that I believe people do not take the step and invest in property and some of the things that you can do in order to avoid these setbacks so you can actually go ahead and begin investing yourself. The first reason I think that people do not invest in property is that it is very hard to invest in a deposit. We live in a consumer culture where it is extremely difficult to save money because there is always something else that you need to buy. I have 3 children and I know there are always things to buy for my kids: new shoes, new clothes, pay for their schooling. There are so many different things to pay for just for my kids, let alone for myself and the things that I want in my life. So we are living in a very consumer culture. It is very difficult to save a deposit because a deposit is generally saved over a number of months, generally over a number of years so it is hard to stay that dedicated in order to save. Now what can you do in order to improve your chances of saving a deposit? There are a lot of different things that you can do which is probably more than I can cover in this particular video. So simply go to Google and type in how to save your deposit fast and you will see an article that I wrote a couple of years ago on 20 Way to Save Your House Deposit Fast and there are some good ideas in there. I do have a course plan for 2016 on how to save your deposit fast and some radical ideas for saving a deposit. But that is not going to be out for a while. The second reason that I think people do not invest in property is that you need a big chunk of cash. In order to invest in stocks, you can invest in stocks for as little as a thousand dollars. You can invest in term deposits for as little as $1. You can put money in the bank and begin earning interest on it. You can invest in a business. You can start a business from scratch if you want. However when it comes to investing in property we are talking tens of thousands of dollars of our own money. And we are talking of hundreds of thousands of dollars in term of the total size of the property that we are going to invest in. So when it comes to shares and things like that where we can invest a little bit and we can grow it over time, it is difficult to do that with property and it is really either nothing or big step up to hundreds of thousands of dollars. That holds a lot of people back because you actually need to commit to property and you need to commit that large sum of money and people might not necessarily want to do that. Our lives change all the time. If you have been following me for any period of time you will see that I have moved many times. My strategies for my business always change. The things that me and my wife want in our life always change. And so by committing to property you lose a bit of flexibility in your life. I know that is something that has held us back from buying our own house is the commitment that that takes. We were very close to buying our own house in Toukley on the Central Coast and then we decided to move to the Gold Coast, quit my 6-figure job, moved into the Gold Coast and go into business for myself. So a lot of people do not invest in property because you need to commit and they do not make that commitment because they want that flexibility in their lives. Another reason people do not go ahead and invest in property is that there is fear around investing. A lot of people are fearful around investing because what if they invest in a property and that property goes down in value. What if they invest at the peak of the market? There is also a lot of fear that drives people to actually jump into the market when they probably should not but I think fear holds a lot of people back from investing again because we are talking such large sums of money and the fear of the process of buying property holds people back as well. People do not know what steps to take or what actually happens in the course of purchasing property. they get fearful about that. They do not know how to deal with real estate agents; they get fearful about that and so they choose not to take any steps at all. So if you are fearful about investing in property and you do not know the process, check out my book on The Essential Guide to Buying Your First Property in Australia. Go to OnProperty.com.au/buy to check that out. Basically that book just walks you through the 21 steps – the major steps, that you need to take in order to purchase your property; things like seeing a mortgage broker, hiring a conveyance or solicitor, making an offer on your property, cooling off period, going unconditional, all these sorts of stuff. So all the steps are laid out in there so if you have some fear holding you back because you do not understand the process then you might want to go ahead and check that out. Another reason more people do not invest in property is that they cannot get a loan. When you are investing in shares you can just spend your own money. If I have a thousand dollars in the bank, I can buy a thousand dollars’ worth of shares. I do not need to go to anyone in order to get approval in order to purchase those shares. However when it comes to investing in property the majority of people – the vast majority of people, are going to need to borrow money in order to invest in property. And even though they may feel like they are in the financial position to do it – they have their deposit, they are earning enough money that they feel like they can pay for the property or maybe the property is going to be positively geared or maybe the mortgage will be less than the rent they are paying now, they still might be unable to get a loan. People who are on …… will find it very hard to get a loan; people on a pension, people who are contractors or self-employed can often find it hard to get loans. So it is something that holds people back and this is true for me at the moment. I have a deposit, I have an income but because I have just started my own business it is very difficult for me to get a loan. So something that holds people back is the fact that they are unable to get a loan in order to purchase a property. So if that is you, the best thing that you can do is go and speak to a mortgage broker and find out why you cannot get a loan and what you can do in order to rectify that and improve your chances of getting a loan. For me, being self-employed, I can get a loan as a self-employed person but I need to show certain income levels and things like that so I talked to my mortgage broker about that. I know what I need to do in order to get a loan and then I just need to decide if I want to take those steps in order to do that because for a lot of self-employed people, if you claim more income and less expenses in order to increase your borrowing capacity, you are paying more tax on that. So it is just whether you want to claim all your expenses or not; you need to weigh those things up. But yeah, if you cannot get a loan go and see a mortgage broker. Find out why you cannot get a loan and what you can do to improve that. And the last reason that I have today for why more people are not investing in property is they feel like they cannot afford it. And this is not the saving of the deposit or getting the loan or things like that but this is they feel like they cannot afford the ongoing expenses that come with owning a property. The majority of websites out there are teaching people to invest in negatively geared property because ‘you save money on tax and depreciation and then you want to get capital growth of hundreds of thousands of dollars in the future.’ And when people look at these and they can see it is going to cost them $100 a week or $200 a week or more, very quickly it becomes difficult to own one property let alone owning 2 or 3 properties costing you $200 per week. So a lot of people feel like they cannot actually invest in property because they cannot afford the ongoing cost of property and that is holding them back from investing. And if that is you, the best thing that you should do is start looking for positive cash flow properties. Start looking for properties that earn more money than you are actually paying in expenses and so they are generating passive income so you can use all of that money to pay your mortgage, to pay your expenses. And then you have extra money left over to fund your lifestyle or to pay down debt or to use towards a future property or maybe even just a bit of cash-savings buffer that you want in case something happens to your property. So if you are being held back because you feel you cannot afford to invest in property then definitely start looking at positive cash flow properties – real ones, and you want help finding them then I do have a service called On Property Listings where I find a new high-rental yield property which has a great chance of being positive cash flow. I find a new one every single day and I share them with my members. Memberships for On Property Listings are limited to just 200 people. There is about 50 spots left at the moment. If you are interested in seeing daily updates of real positive cash flow properties that are on the market, available for sale today then check out On Property Listings by going to OnProperty.com.au/Listings. So go and check that out before the spots fill up because once we reach 200, we then will not be allowing any more members in unless people cancel and spots open up. Guys, I hope that this has been helpful. Why are more people not investing in property? There is a multitude of things holding people back. If some of these things are holding you back, take some steps to alleviate these so you can go ahead and invest in property. So if you are finding it hard to save your deposit, check out those tips that I have on saving your deposit and create a savings plan for yourself. Ideally, pay yourself first. So when you get paid, put your savings first and learn to live off the rest or earn more money so you can live off the rest. If you are struggling because it is a big chunk of cash and you are struggling to commit around that, well, that is again why I love positive cash flow properties because if I invest in a property and it is negatively geared and I need to pay $200 a week in order to own that property, I am kind of committed to earning a certain level of income in order to afford my investment. However if I own a positive cash flow property, I can go overseas. I can quit my job. I can do what I want and at least I know that my property is paying for itself. So if you are scared to commit, positive cash flow properties give you the best of both worlds because you have the income coming in – the property is paying for itself, and it can actually increase the flexibility in your life because you have actually a little bit of passive income as well. I was talking to a customer of mine and he had fully paid off his home, had a couple of positive cash flow properties that were paying for his home expenses like his council rates, insurance and stuff like that. So he was in the black in terms of his rental accommodations and things like that and all he had to make money for was his entertainment money and money to buy food and things like that. So imagine how flexible he is in his life compared to someone who is negatively geared and needs to earn a thousand dollars a month in order pay for their properties. They are really stuck, they need an income. He has the flexibility because he has that passive income to only earn a little bit or he can expand and try and really grow his wealth. If you have fears around investing, I think the best thing you can do is to educate yourself. Learn about property investing. Learn about the steps towards buying a property. By increasing your level of education you generally decrease your fear because you feel more knowledgeable about a situation. If you cannot get a loan, go and see a mortgage broker and find out what you need to do in order to get a loan. And if you feel you cannot afford it then definitely look at positive cash flow properties and check out On Property Listings at OnProperty.com.au/Listings. So I hope this has been helpful to you guys.